UNIVERSAL SECURE FIT: This toddler safety rail has double non-slip grip strips on the bottom that secures firmly to the bed, even with very active sleepers! It's great for transitioning tots from their crib to a big bed and works in ALL beds: convertible cribs, kids twin beds, airbeds, and double, queen, and king sized beds. 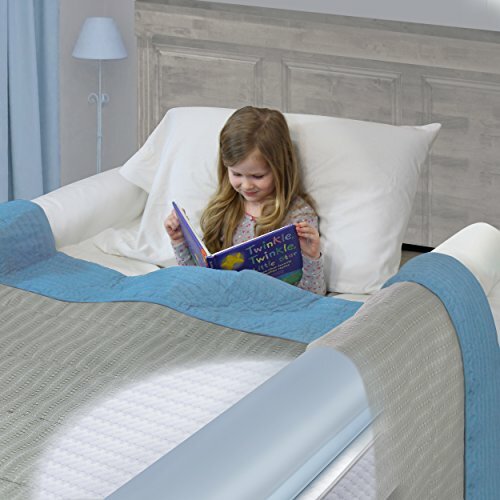 FULL OF AIR, YET TOUGH AS NAILS: Unlike other inflatable child bed rails, this bed bumper will stay full 'n firm thanks to a leak-proof, airtight construction which can support weight of to 300 Lbs.! Designed with a unique valve technology, it blows up in seconds and deflates at the push of a button. Meets and exceeds all CPSC & ASTM child safety regulations TESTED & CERTIFIED. ULTRA-COMPACT & PORTABLE: When deflated, the Royexe kids bed rail is small enough to fit in a pocket and easy to pack and bring along on road trips, family vacations, hotel stays, or sleepovers. It is invisible under sheets and impervious to nighttime accidents thanks to its' water-resistant coating. 100% SATISFACTION GUARANTEE: We're so sure you'll love the Royexe kids travel bed bumper, we offer a no-questions-asked money back guarantee! Just contact our customer support team in case of any issues with your purchase for a quick, hassle-free refund.